The history of Africa in the late twentieth century is a turbulent one, characterised by instability and conflict. At the heart of this book is the story of how opposing groups have desperately tried to gain or hold power through the use of armed force. Often poorly trained and ill-equipped, the governments of these countries took to paying mercenaries for assistance. 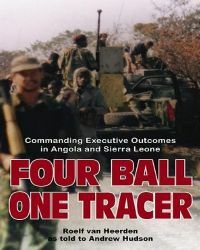 Executive Outcomes were one such organisation who operated in the 1990s, undertaking ‘assignments’ for legitimate governments in the African continent. Here one of the key members of the organisation recounts some of the operations he was involved in from 1993 to 1996, both in Angola and Sierra Leone. The men who worked for Executive Outcomes were all ex-military, highly trained and with years of experience between them, and at its peak the organisation functioned more like a private army, equipped with tanks, artillery, and air support – all required for the often ferocious fighting they participated in. However superior training and equipment did not always equate to safety and protection; casualties were sustained and the anger and frustration at losing comrades is apparent. The author was involved in some intense battles and his operational career ended when he himself was wounded during a firefight. During its lifetime Executive Outcomes increasingly attracted media attention for its activities. The morality of what they were undertaking is touched upon, but ultimately it is left for the reader to decide whether they truly were mercenaries, just in it for the money, or whether what they were trying to achieve was for the good of the countries in question. The book is well illustrated with many of the author’s photos, alongside useful campaign maps and orders of battle that supplement the author’s detailed accounts of the preparation and logistics of each operation. At times harrowing, sometime humorous, this book provides a fascinating and eye-opening insight into the murky world of private military companies.